Deceased May 17, 1969, Athol, Massachusetts. Anthony H. Niederst, 19, son of Mr. and Mrs. Ralph L. Niederst, Rocky River, was killed Saturday night in a two-car crash. Four of his sophomore classmates at Williams College, Williamstown, Mass., were injured in the wreck in Athol, Mass. 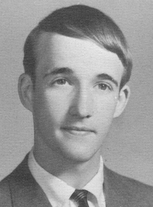 Niederst, a pre-medical student was president of the student council at Rocky River High School, from which he graduated in 1967. He was a National Merit Scholar. Besides his parents, a brother survives. Published in The Plain Dealer May 19, 1969.